Prometheus Cain, Consciousness, visual depiction of awakening. 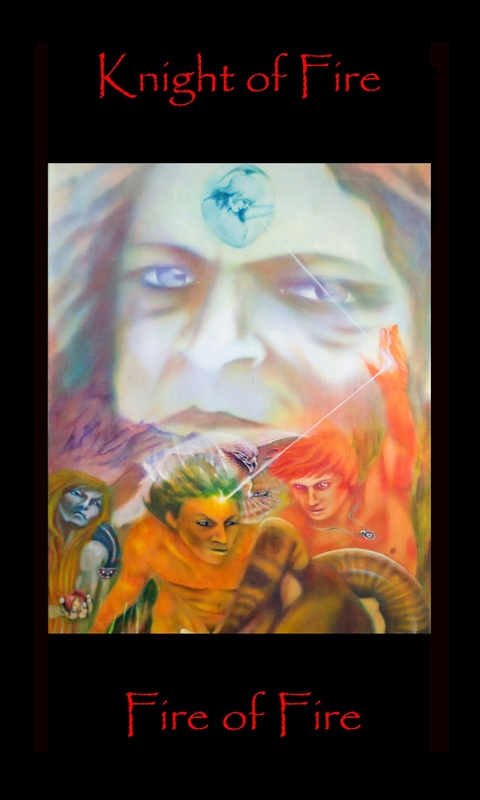 My painting looks at the mythological dynamic from two perspectives. It is illustrating the phenomena of enlightenment being shared prior to the punishment being executed. From the Greek perspective it is the agent of enlightenment to man, Prometheus,who is the one suffering the wrath of the Gods. In the Jewish/Christian philosophy it is the receiver of enlightenment, Eve, who suffers the wrath of God. In the background is Zeus looking down from his domain of Olympus. He appears remote, almost uninterested in the dynamic being played out before him. Catching the ray of knowledge that is expressed by Athena emerging from the brain of Zeus Prometheus, a thief, is a symbolic conduit passing it on to the figure in the foreground, the “New Man”. Eve stands to the left holding the fruit of the underworld, a pomegranate, with which she is now empowered with her consort the serpent. For her the figure in the foreground is Adam. However, Adam has evolved into Cain with the knowledge of slaughter, who’s victim is represented by the sacrificial ram before him. Consciousness is realizing that we have choice. A detail of this painting is used for tarot court card Knight of Fire, Fire of Fire in Tarot of the Morning Star.